Lavish in lake view paradise! Boasting a breathtaking lake view holiday haven, this contemporary holiday retreat offers the perfect choice for young families staying on Lake Lugano! The open plan layout of the contemporary ground floor villa apartment is ideal for enjoying a relaxed and exclusive lakeside holiday stay, with all the mod-cons provided for real home-from-home comfort. Guests can enjoy the freedom of delicious home cooked meals during their stay, with a fully equipped modern kitchen provided alongside a stylish indoor dining area and an outdoor covered lake terrace with BBQ just perfect for enjoying lake view alfresco dinner parties! The sitting room is ideal for relaxing in the evenings, with a comfortable sofa and SAT TV to enjoy. The long summer months allow guests to make the most of the sunny shared outdoor lakefront garden, which offers guests with a private beach, lakeside sun deck and even a jetty with boat mooring facility! The contemporary apartment offers a comfortable double sofa bed to the living room and a lake view bedroom ideal for children, with a set of modern bunk beds. A modern fitted bathroom with bath tub, power shower and washing machine completes the internal layout of this immaculate and exclusive holiday villa apartment. Outside the shared lakefront garden offers a beautiful idyll in which to relax, with a private beach and sun deck to accompany the soothing sound of lapping lakeside waves from a passing boat. A private mooring facility is available for guests to use at a cost of EU150. Guests can also find a parking space in the residence and the local amenities of Porlezza are also situated nearby for guest’s convenience. Two bikes are available free of charge. The fashionable Swiss lake capital of Lugano is also within easy driving distance and offers the perfect distraction for enjoying designer shopping, sightseeing, dining and evenings out at its contemporary Casino and bars. 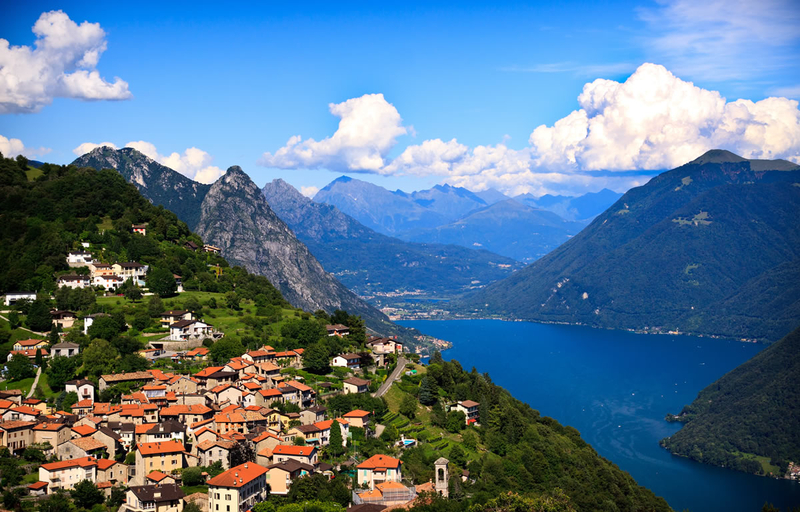 The Italian and Swiss Lake District offer a multitude of leisure activities, visitor attractions and picturesque resort towns to enjoy in all seasons. Outdoor leisure pursuits range from hiking, cycling, swimming and skiing, to power boat rental, kayaking, wind surfing, sailing, tennis and golf! For those looking to relax and replenish the senses, the many day Spas on Lake Como also offer the perfect treat for couples and friends!